This view of Iwo Jima, from the top of Mt. Suribachi, provides a view of the invasion beach. The photographer, Looper5920, has released the photo into the public domain. Although the Marines who attacked Iwo Jima had practiced and practiced - for nearly a year at Camp Pendleton, then in Hawaii - this, for many, was their first real battle. Experienced veterans, barely in their mid-twenties, remembered other difficult invasions and battles to liberate Japanese-occupied islands. Tarawa, Bougainville and Saipan had been brutal stepping stones to Sulphur Island. 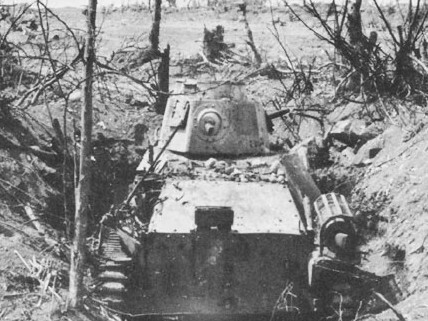 Light Japanese tank dug-in near Airfield Number 2. USMC photo. Japanese mines, and heavy artillery fire, soon decimated equipment, including troop transports (like these LVTs). When the defenders opened fire, their snipers dropped Marines everywhere. Members of the 25th Marines, attempting to move away from the beach, were pinned down by constant, accurate enemy fire. Loaded with equipment, Marine communicators tried to stay alive as they moved inland, from the beaches, under heavy fire. Navy corpsmen, assigned to the Marines as medics, had dangerous, gruesome work at the front lines. By the time the battle for Iwo Jima was over, 827 corpsmen and 23 doctors were killed or wounded in action. Having landed at beach “Red 1,” and within sight of Mt. Suribachi, 5th Division Marines were forced to move slowly over volcanic-ash terrain. During the Navy’s preliminary bombardment, sand-covered bunkers had been hard to spot. Flame-throwing Marines, en route to airfield number 2, had to do the job on the ground. John Basilone, who'd won a Medal of Honor for heroic bravery during the Battle of Guadalcanal, was one of the Marines who attacked Iwo Jima on D-Day. Although sent back to the States, to help sell war bonds, he quickly tired of the glamour and requested a return to action. Military leaders finally agreed and sent him to Camp Pendelton. While there, Basilone met Marine Sergeant Lena Mae Riggi. The two fell in love and married on July 10, 1944. The next month, John's orders required him to ship out. His ultimate destination was Iwo Jima where he became a D-Day casualty. His widow, who never remarried, died in 1999. Most of the Marines never saw a single hidden Japanese during the entire battle, even while they experienced the full brunt of the island's defense system. And had it not been for Navajo code talkers, whose communications were never understood by the Japanese, D-Day casualties would have been far worse. Bos, Carole "D-DAY: 19 FEBRUARY 1945" AwesomeStories.com. Oct 01, 2006. Apr 23, 2019.